France and Germany slam the brakes on further liberalising the international haulage market. Also, catching up with recent developments on Scotland’s premier driver’s road, the North Coast 500. Gotthard Pass reopens after rock fall scare. Increased security at Brussels airport sees long queues on R0 ring road and E40. New eco windscreen stickers in France and Germany. EU major players against relaxing cabotage rules and want international vans regulated. 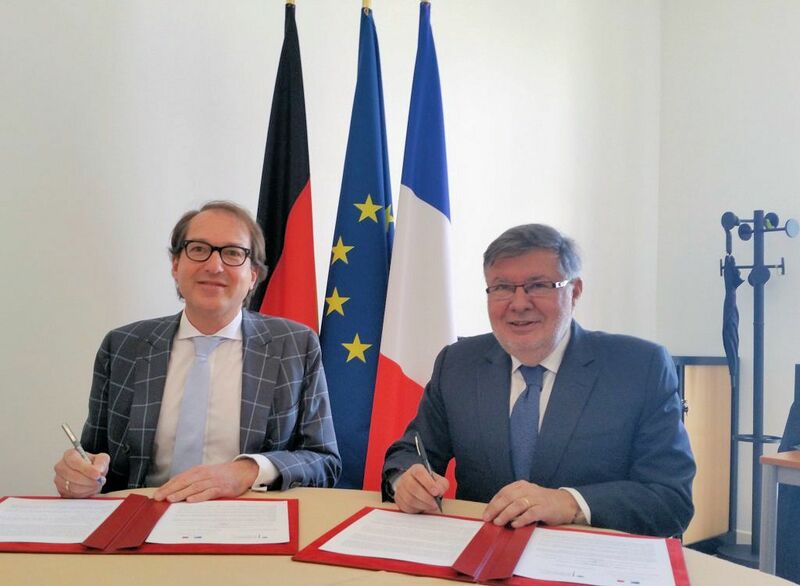 German Transport Minister Alexander Dobrindt, left, and French Transport Minister Alain Vidalies. France and Germany are both opposed to relaxing so-called cabotage laws governing international transport and want light commercial vehicles brought into the regulations. French transport minister Alain Vidalies met his German counterpart Alexander Dobrindt in Metz, eastern France, on Thursday (7 April). A statement from Vidalies afterwards said, ‘France and Germany stress their determination to maintain the EU rules on access to the transport market of goods, in particular as regards cabotage. Cabotage is the haulage of goods in one member state by a vehicle registered in another. Vehicles are allowed up to three cabotage jobs in seven days within the host member state. Vidalies is also due to publish a report on better enforcement of international transport rules on Friday 15 April. Meanwhile, from 1 July truck drivers making deliveries in France must be paid at least the French minimum wage Vidalies announced on Friday. As in Germany, which brought in a similar rule last year, the minimum wage will not apply to transit journeys. France has apparently also been applying a new interpretation of double-manned drivers’ hours in recent weeks whereby 45 minute break periods must be taken in a stationary vehicle. By coincidence, last week MEPs on the Transport and Tourism Committee voted overwhelmingly in favour of a new report criticising unfair competition in road transport. The move by France and Germany is likely to figure in next Tuesday’s EU Road Transport conference. One of the main items on the agenda is ‘the Internal Market and Social Aspects of Road Transport’. The North Coast 500 is best driven anti-clockwise so the scenery improves each day says one man in a tweet endorsed by @NorthCoast500. Scotland’s premier driver’s road has gone from strength to strength since starring in last year’s EVO magazine ‘Car of the Year’ film. It runs for 500 miles in a circular route through the Highlands from Inverness. In addition to a new smartphone app, there is also now a membership scheme. In return for £15 per year, members receive a list of benefits including map, window sticker, ID card, monthly newsletter, competitions, special offers and access to the website’s forums. The £45 per year Explorer membership adds a discount card, personalised itinerary and ‘route support’. Meanwhile, North Coast 500 has drawn attention to Scotland’s very relaxed Wild Camping Regulations. If that’s not your thing then the Kylesku Hotel on the northwest coast has just won Scotland’s Most Hospitable Hotel award (Loch facing double rooms from £140). Adventurous electric car drivers might also like to know charge points are now available throughout the route. Photo: Heilam Brae looking toward Loch Eriboll via NorthCoast500.com. roundup: SWITZERLAND. The northern stretch of H2 Gotthard Pass in the Schollenen Gorge between Goschenen and Andermatt closed late Saturday after ‘movement’ was detected in rock high above the road. Some 120 cubic metres of rock was in danger of falling from 250 metres higher up the mountain. The area was being intensively monitored after a lesser rock fall on Tuesday according to SRF.ch. Local authorities carried out three controlled explosions on Sunday afternoon. The road reopened at 21:00 though work continues today with short temporary closures likely. The Schollenen Gorge closed for six weeks last summer after rock fall severely damaged an avalanche gallery above the road. The road here is also undergoing major works until 2019 with permanent alternate traffic though it is suspended for summer weekends. Meanwhile, the southern stretch of Gotthard Pass is scheduled to open in early June. BRUSSELS. Increased security at Zaventem airport saw traffic back up into long delays on the R0 ring road and E40 to the east of the city this morning. The airport was scene of terrorist attacks on 22 March and has been gradually reopening over the past week. By 09:30 local time this morning there was still a 45 minute delay on the inbound E40 from Leuven. Many passengers left their vehicles and walked along the carriageway. Jams on E40 and R0 had dissipated by 11:00 local time but there was still a long queue on the A201 airport access road. There is no indication if and when the situation will improve though one official told Deredactie ‘the security checks are not sustainable’. (update 12 April: queues not a problem this morning says Deredactie.) AIR QUALITY. France’s new voluntary ‘pastilles’ – four coloured windscreen stickers noting vehicle age and engine type – will finally be available from July. The new system allowing mayors to ban older and/or more polluting vehicles from certain areas in town and cities, permanently or during pollution peaks, was to be ready in January says Autoroute.info. One of the problems is Paris where the pastille categories do not correspond to the vehicle classes already laid out by the capital and now subject to progressive bans – i.e. from 1 July 2016 all petrol vehicles built before 1997 will be banned from the centre, and all diesels built before 2001. The city wants seven category pastilles. Possibly as a sop, Environment Minister Segolene Royale announced on Friday a streamlining of the system where traffic restrictions can be brought in during pollution peaks. The ins and outs of the procedure are not yet clear though Paris mayor Anne Hidalgo has already said she is ‘disappointed’. Meanwhile, all but the very newest diesel cars could be banned from Germany’s inner cities by the end of the year it was announced after a meeting of the country’s Environment Ministers on Friday according to Automotive News Europe. A new ‘blue badge’ representing NOX emissions below 80g/km will be added to Germany’s existing roster of windscreen environment badges which police ‘low emission zones’ in many towns and cities. See more at Umwelt-Plakette.de.